We could take geomorphology lessons without classrooms, understanding in miniature what flooding rivers and creeks are regularly showing. Gravity impels sediment-laden water downwards and across floodplains. The land is revitalised by soluble nutrients and by the gradual breakdown of coarser debris. On the lower edge of the Reserve there are no houses, farms and cities to be damaged by water’s power so the effects of erosion can be seen. Leafy and woody debris collects against obstacles such as plants, roots, rocks and twigs or branches jammed across the water’s flow. 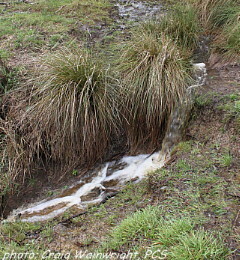 These natural dams or leaky weirs slow the water down causing it to spread across the land rather than erode the substrate more deeply. If seeds are trapped in the debris seedlings germinate making the structure more permanent and keeping nutrients from future run-off in the local landscape. Particles of reddish soil build up, deposited according to size and flow volume, rest across the shallow valley that the track has become over time. Sometimes the delta-effect that we learned about in school is visible as the main channel splits into branches separated by the lines of smaller channels and the particles the water has deposited. To see real deltas and their meandering distributaries on a wider scale requires a flight or a TV documentary. In some places collections of very fine, silty particles that were are evaporated puddles now show smooth, homogenous surfaces. Trivial disasters await those who step there as the silt is slippery, gluey and possibly deeper than it looks. We’re lucky that, close to home and by trial and error, off-the-path-walking teaches us how to read the landscape. We learn how rivers and creeks have behaved for millions of years. We’ve all been guilty of demolishing a toadstool or two but let’s make this warm, wet summer a time to reflect on these diverse organisms. 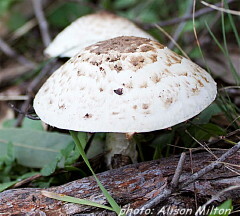 Each ACT household has received a warning about eating Wild Mushrooms following the deaths of two newly arrived visitors. Toxins in some fungi are extremely potent, destroying the function of liver and kidney cells. There are over 500 species illustrated and described in Bruce Fuhrer’s "Field Guide to Australian Fungi" and he’d be the first to admit that this is but a fraction of the fungi that exist here and an even smaller proportion of fungal species worldwide. It’s not surprising that fungi in Australia include many species that have been imported in soil, vegetation, on plants and with animals’ help as their spores are very small. Unless time is spent studying the form and development of toadstools and mushrooms it’s easy to be confused about difference and similarities between species. Fungi are essential in all land ecosystems. Most plants have symbiotic relationships with fungi from seed-germination onwards. Mycorrhizal fungi have relationships with the majority of plants which allow the fungi to draw sugars and water from the green plant. Enhanced nutrient and minerals uptake is the fungi’s contribution as well as “antibiotic protection from pathogenic fungi and soil borne organisms.” Saprophytic fungi are those specialising in the breakdown of dead organisms and in the recycling of waste material. These fungi recycle plant litter into natural fertilisers. Fungal threads or hyphae grow into decaying plant material releasing enzymes, which allow absorption of nutrients from the dead cells. The hyphae grow into the soil or leaf-litter as a web-like mass or mycelium. This may extend for many metres. New toadstools grow at the mycelium’s tips each season giving rise to ‘fairy rings’ in some species. Fungi don’t make their own food. Lichens result from the symbiotic relationship between fungal species and algae or cyanobacteria which are the food-producing elements of these partnerships. Toadstool shapes are the visible reproductive or fruiting bodies of the fungi. Spores develop under the protective cap, blowing away on breezes when ripe. Other groups have pores through which the spores disperse and others form bracket shapes on wood. In just a few weeks following rain the novice can collect photographs of a large range of fungi. The diversity of shape and colouring is staggering. Many of the fruiting bodies are obvious for only a day or two. They are appetising to springtails, mites, slaters, slugs, snails and some species of flies and beetles lay their eggs on or in fungi. Small mammals eat fungi and the foraging of many extinct mammals not only spread fungal spores but also aerated the soil by their digging. There are several species of native truffles at Mulligans Flat Reserve and elsewhere in our region. Fungi are a natural part of the local ecosystem. For some there’s a temptation to knock them over because they’re toxic. Let’s take the chance the summer-rain has given and look more closely at both the large and minute fungi that are around us. Perhaps even ponder the extraordinary forces within growing cells that allow the fungus to emerge through compacted soil, asphalt and the edges of concrete. Give yourself time to study their intricate and delicate structures by holding a mirror under the cap or photographing the parts of these organisms that we can see. For more information, see Fungibank. The emerging sun highlights a couple of rose hips on a ribbon-adorned bush. The Briar Rose (or Sweet Briar) has been sprayed as part of Warren’s systematic targeting of these introduced “original roses”. Even though fotpin volunteers have removed hundreds of Sweet Briar bushes in the past couple of years, many more have emerged from seeds already in the soil or dropped by birds, possibly from the paddocks to the Reserve’s south. When some work on The Pinnacle’s woody weeds was done in about 1997 I remember finding the most wonderful small nest amongst the thorns and branches of one of the bushes I chopped down. I kept the nest on its branch for years as a realia exhibit at school. It showed many students the brilliance of the wrens’ construction woven together with cobweb and made them think of the birds’ no-hands skills. We could also see the value of the prickly bushes as shelter from predators. Current weeders prefer to specifically spray the bushes so that the dead remains are there for birds moving through the open landscape. Rosa rubiginosa was introduced to Australia by the early settlers who often hankered after the familiar animals and plants they’d been used to in Europe and Britain. Rose hips were widely used as a rich source of vitamins C, A, D and E together with iron, calcium and antioxidants. We were given Rose hip syrup as children at the end of the Second World War. Every weeding autumn I wonder about putting in an advert for people to harvest the rose hips from weeds in our bush areas to make this excellent syrup or jelly but who would devote the time to battling the thorns? They’d need to be collected before the birds find them attractive and spread them into new areas. An English friend reminded me of the schoolyard prank of crushing up the hips and putting the pulp down others’ backs. A guaranteed disturbance in our classrooms! Even the web mentions that rose hips’ hairs were used in joke itching powders. If I had delved longer I might have discovered which animals the thorns evolved to deter. The Sweet Briar’s flowers are delicate pink and white and have the gentle unique “rose” perfume of the ancient species. Even the bushes and leaves have a certain aroma when touched or cut. Presumably this comes from oil glands. It’s amazing to contemplate how much roses have been developed, over many centuries, into the prize blooms, colours and perfumes we expect today. A Dragonfly clings to a tall plantain stalk. My photographs don’t show the raindrops on its wings, presumably weighing it down. It has to wait for the sun to evaporate the water before it can fly out of this dangerous situation. Perhaps it’s merely waiting for the sun’s warmth to bring its body temperature up so muscles can shake the wings free of their jewelled covering. Dragonflies are so swift in flight and so skilled at manoeuvres that it’s hard to look at them closely. There are about 6000 species worldwide and 320 species in Australia. They exhibit great manoeuvrability and yet their wings systems are amongst the most “primitive” in the insect world. One fossil dragonfly from 300 million years ago, long before the advent of the dinosaurs, had a 60cm wingspan. Dragonflies and Damsel flies are related, though Damsel flies have slighter structure and rest with their wings closed together. Dragon fly wings are like aerofoils but they have corrugations rather than being smooth as we might expect. Enormous compound eyes containing thousands of individual lenses contribute to the dragonfly’s ability to hunt other flying insects. They can grasp their victims as though their legs & feet were talons. Many of the eucalypt trees in the Reserve show signs of Lerp infestation. Their leaves are blotched with pink scarrings caused by the insects. Younger trees seem to be more affected than the older ones, but perhaps it’s all a question if visibility. Lerp insects are sap suckers. They construct as waxy scale-like covering beneath which they shelter and feed. A hand lens reveals that the structures have a lace-like, delicate beauty. Insectivorous birds forage in the trees’ canopy and amongst branches for the insects and the encrustations. The trees may be defoliated but they usually recover in spite of appearances. Exudates from some lerps is sought-after by ants. The teams of ants collecting this honeydew reveal another complexity in the forest’s life. The importance of trees and shrubs as hosts to a wide range of insects that we’d not normally associate with trees.